Each class has an opportunity weekly in the library to listen to books chosen by the librarian or teacher associated with a classroom theme. Books are also available in the classroom based on the theme of the month. 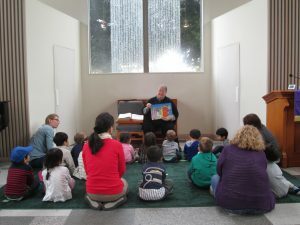 Children have the opportunity of check out a book weekly from our diverse collection of fiction and non-fiction books. Our school library, continues to expand for student and teacher use. REMINDER: Your child must return the book in order to check out another one. Meets on Monday and Thursday in the church sanctuary. 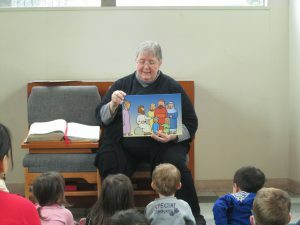 Bible stories are told at an age appropriate level followed by a prayer and bible song (also known as hymns). Our chapel schedule is posted in the classroom and available upon request. 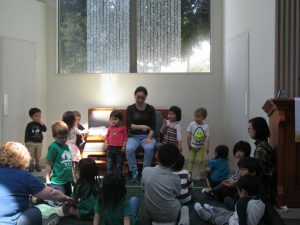 Older children attend the Children & Worship program at the Green House with Nozomi Brownell. Nutritious lunches from home are requested to be high in vegetables and fruit. Refrigeration and microwaves are not available for use so insulated lunch boxes and thermoses are helpful. Please take care to chop lunch items to an appropriate size for your child’s age. Hot Lunches are available from Cezar’s Kitchen at St. Maur International School and can be ordered for your child at the office on an occasional or regular basis. Menus are posted at school.